A couple years ago my now-3rd-grade-daughter, Rhyinn, gave me a plant for Mother's Day. She had started it from a seed. For a month or so, not much happened, but then the straggly stem exploded with flowers. Despite the nice sunny spot on the windowsill,though, the leaves and flowers eventually fell off. Consequence of overwatering? not consistent watering? roots too big for pot? My green thumb and I had no idea. And that's the story we're forever sticking with. Well, around Thanksgiving that year I did a Britney Spears on the leaveless stems. Chop. Chop. Chop. Yes, what remained looked like a leftover prop from the set of The Nightmare Before Christmas. Didn't take long, though, to notice new leaves growing. By Valentine's day it was it full bloom. You and I can be like that Mother's Day plant. Too much food makes us fat. Too much wine makes us drunk. Too much makeup makes us scary. No is NOT a four-letter word. One of my kids once founda cross necklace and put it on our dog. Cute. Sadly, though, wearing that cross necklace doesn't make DeeOhGee any more spiritual, any more of a good-fruit-producer. He still barks at the neighbor kids. Still uses the backyard as his bathroom. Still is a dog who licks his unmentionables. As we approach the end of 2011, it's time we start thinking outside, inside, on top, around, and under the green box. Wrap the green box. Reuse the green box to plant flowers or make a dog bed. Maybe, just maybe, you need to take a stand on that green box. just as you were taught, and overflowing with thankfulness. 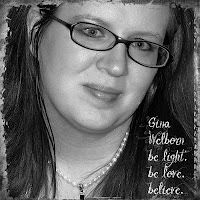 GINA WELBORN loves watching Surviror and Community, playing Mario and Zelda with her middle child, and baking anything sweet and tasty (talk about redundant!). Years—okay, eons—ago, Gina worked in news radio scripting copy until she realized how depressing human tragedy was, so she took up writing romances and now only thinks “It is time for a dead body?” when she’s at a lull in her newest manuscript. This Oklahoma-raised girl now lives in Richmond, Virginia with her youth-pastor husband, their five Okie-Hokie children, and a Sharpador Retriever who doesn’t retrieve much of anything (but he can sit really well). Her first novella, “Sugarplum Hearts,” part of the HIGHLAND CROSSINGS anthology, will be released by Barbour in February 2012. Her second novella, "All Ye Faithful," release fall 2012 in the A CASCADES CHRISTMAS anthology. You're so right, Gina. We all need pruning from time to time. It always seems that whenever something less than good happens, if I dig deep enough, I can see where God is using it to prune me. I'm not saying God made whatever it was/is happen, just that He can (and usually does) use it to make me a better person. Well, as your resident horticulturalist, I approve this message. Once again, I commented this morning from my iPod and it promptly disappeared. Sometimes I think we even act out in the hopes we'll get a good pruning. What do you think? P. S. I have a brown thumb. I just don't get joy out of gardening. If I sew something, dagnabit, it stays sewed! But the more you work in a garden, the more work you have to do to keep it that way. You're comment about taking a stand on the green box made me laugh, since I've already decided you have a soapbox permanently attached to the bottom of your shoes, Gina. You're so right (of course). We all have seasons of growth and rest--and we all grow better when we've been pruned. Even though it can be a bit scary and painful sometimes. Speaking of pruning, I need to deadhead some roses. Unfortunately I found out i have stagnant hair. Seriously, I get it cut in different ways by different people, and it always seems to look the same. Has a mind of its own. I almost took that stagnant hair comment and ran with it (as in running with scissors). I've never found a hair style I like. The easiest and most practical for someone who wants to spend zero minutes on primping is called a rubber band. speaking of pruning, where are those scissors? I must have some sort of primal fear of stagnation. I rearrange furniture and try new hairstyles seasonally. Drives my family nuts. And yet, I find myself stagnating when it comes to my daily schedule... talk about stuck in a rut! Thanks for the terrific post, Gina!